Our three year old class is open to students who turn three years old on or before December 1st of that school year. Socialization is a strong focus for this class. Skills are woven into the curriculum through routines and activities. Preschool readiness skills such as lining up, taking turns, sharing, listening to others, and using manners appropriately are emphasized throughout the day. 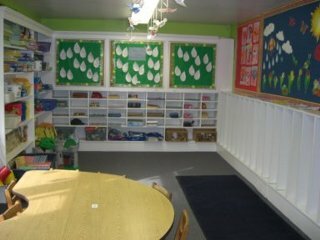 Routines are established that help the children to feel comfortable and in control within their surroundings. Circle time includes jobs for the children, finger plays, songs and discussion about the day’s theme. Monthly thematic units reinforce basic concepts such as colors, shapes, the numbers one through ten, seasons, and holidays. Arts and crafts activities help to exercise fine motor skills. During monthly cooking activities, measuring ingredients help the children with pre-math skills such as counting. Story time is a special part of the day and guest readers are welcome. Occasional visits to the local library are always a treat. Gross motor skills are exercised outside at our playground or inside by participating in games and dances. A short period of time is designated snack time at which mealtime and conversation skills are reinforced. Our three year olds for 2 ½ hours each session in the Montgomery Nursery School.